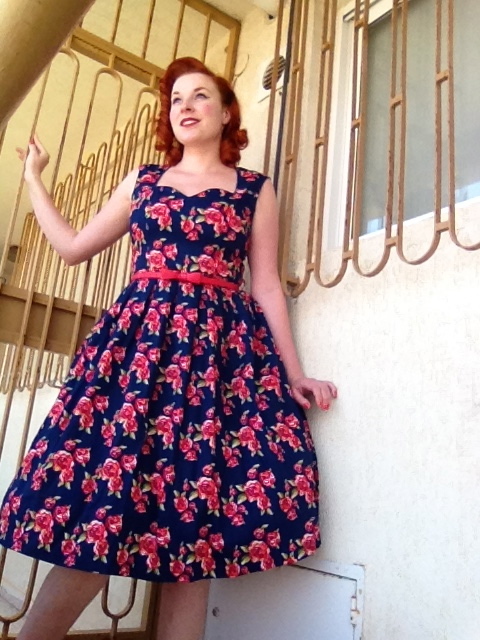 Today I review one of my recent additions to my closet, a dress gifted to me by my sweet sister, the Scarlet Dress by Lindy Bop. 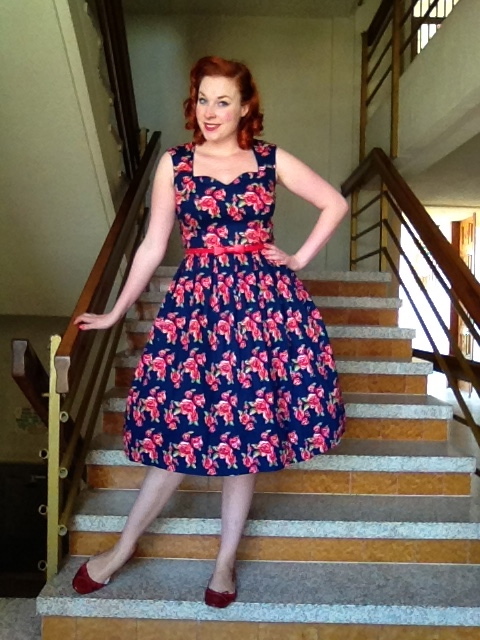 This dress has been purchased at Salon Bonbon in Heerlen, the Netherlands. I have written a review on this store before (click!) and the owner Leonne has such a nice collection. 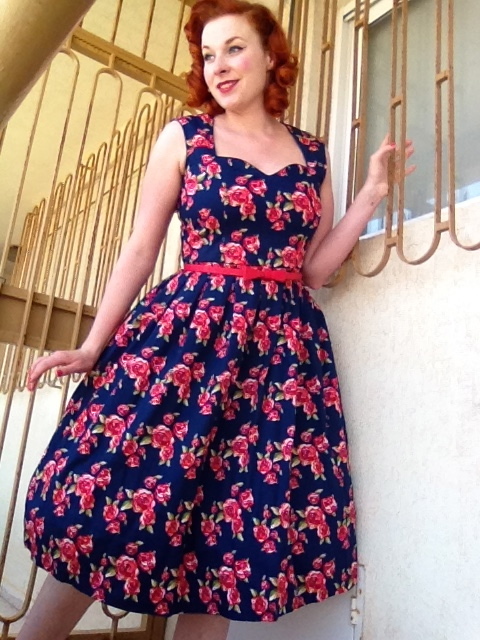 I am a big sucker for floral prints and especially roses. This dress struck me almost immediately, I tried it on and I LOVED it! Unfortunately I didn’t have any budget for a new dress since this was just a couple of days before I made my move to Spain so I put it back in the rack (if that isn’t self-control I don’t know WHAT is!!). Later that same day my sister came in to buy me a goodbye present and the owner of Salon Bonbon told her how much I loved this dress but that I had to put it back. So she got it for me as a dress to wear when Mr. Tulips and I would go celebrate my arrival. Isn’t that sweet? 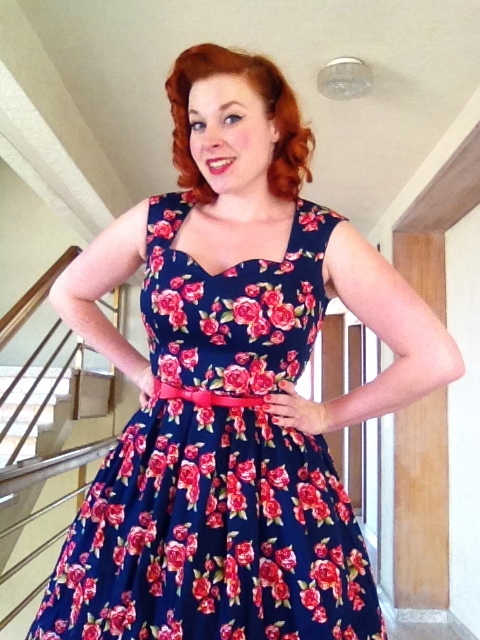 Lindy Bop is a UK based brand that makes low budget but very fabulous dresses. Over the years they have grown out to become a big name in the vintage reproduction business. 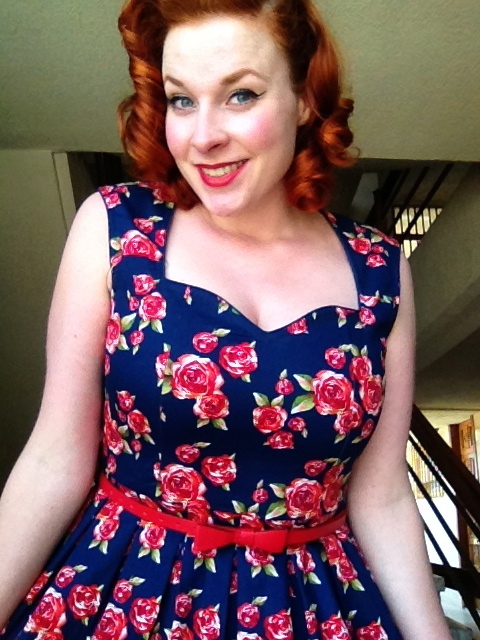 They have significantly improved the quality of their dresses making this a brand you have to have in your closet being a pin-up girl. I have quite a lot of dresses by Lindy Bop and every time I am amazed by the quality and fit of these dresses, although I must say that I do prefer to buy these dresses in a real live store instead of online, because the fits of their dresses differ quite a lot per style, and I can try them on before I buy them. Part of the massive difference in quality in comparison to the beginning year(s) of Lindy Bop is that they use a different fabric. This fabric is thicker, has some stretch to it and doesn’t wrinkle easily. Besides the amazing colour combination, I immediately loved the sweetheart neckline and the cute faux leather belt with a bow. The top of the dress is perfectly fitted and the skirt is pleated at the waist. Even though the skirt is not a circle and is more tulip shaped, a medium sized petticoat does fit just fine. I am wearing a Lindy Bop petticoat underneath the dress. After using the belt for a bit I was kind of disappointed. There seems to be a bit of a manufacturing mistake with it, either the pin is too small, or the holes in which the pin goes are too big. This resulted in it opening all the time, and I had to resolve it by piercing an extra somewhat smaller hole in the belt. I wouldn’t say that this dress is a typical summer dress since the fabric is not thin enough, it could be a bit too warm when the temperatures go way up, I would say this is more of a Spring and early Summer dress, but I can see myself wearing this beauty during autumn and winter as well paired off with some thick tights and a cardigan. 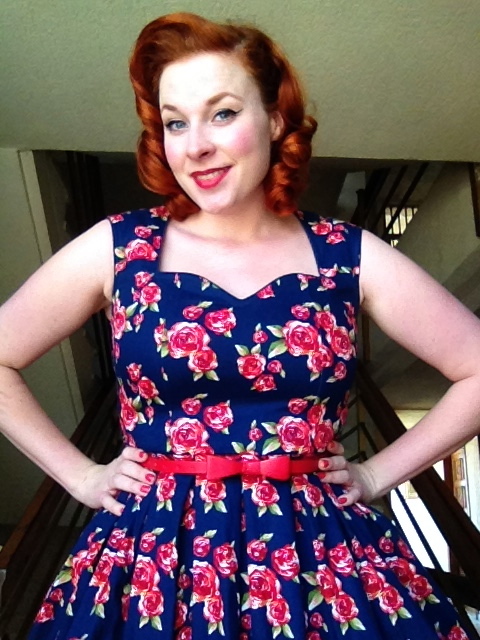 So are there any specific Lindy Bop dresses you would like me to review? I’d love to hear from you!